Last week a few selected bloggers including me, were invited to attend a healthy eating event at Richmond Towers Communications (RTC) in London. 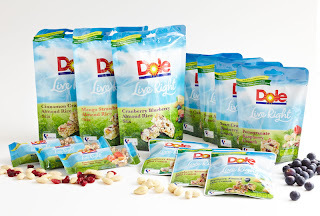 The event was part of a new product launch from Dole. We also got to meet well known TV Nutritionist, Amanda Hamilton who was there to promote the benefits of healthy snacking. 'Dole Food Company, Inc. is the world's largest producer and marketer of high-quality fresh fruit, fresh vegetables and fresh-cut flowers'. 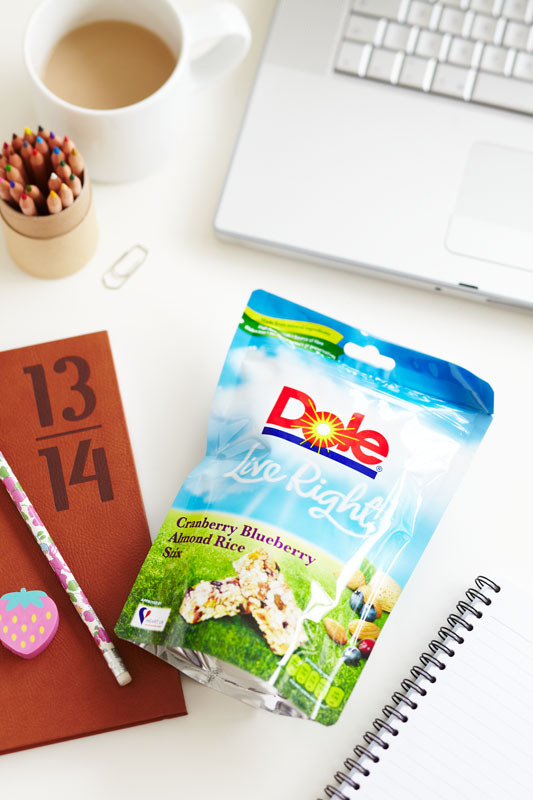 Here in the UK, Dole is probably best known for their canned fruit and handy fruit pots which are ideal for snacking outside the home. 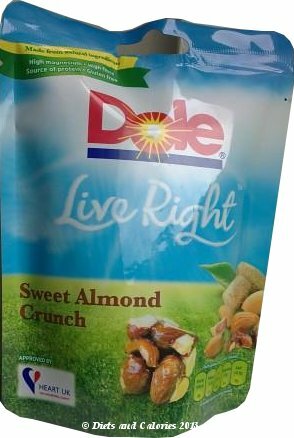 Continuing with the 'snacking' trend, Dole's new 'Live Right' range consists of a selection of 'on-the-go' delicious snacks made from nuts, fruits and seeds. They're so healthy they've been endorsed by HEART UK. According to findings from a Dole Live Right study, one in two workers don't leave their office all day. This means workers are more likely to end up snacking 'al-desko'. The same study found that 39 percent ate a mid-morning snack at their desk with 31 percent snacking in the afternoon. Of these, 27 percent admitted to snacking on biscuits and chocolate bars a least once a day. She also advises us to keep food real and if you can't pronounce what it says on the label, then you probably shouldn't be eating it. Foods containing real ingredients, such as Dole Live Right can help you feel fuller for longer. 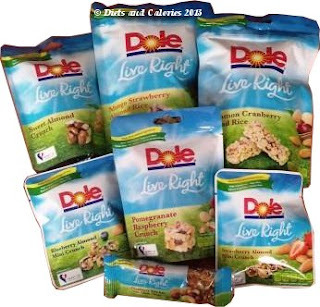 These include 20g single portion sized bags of miniature bite-sized fruit and nut clusters. Almonds and sesame seeds are combined with brown rice syrup together with dried fruit. Varieties include Cranberry, Strawberry and Blueberry. 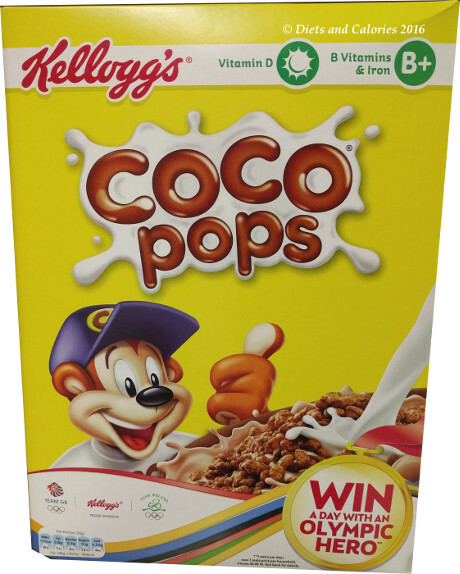 These packs are slightly larger at 56g and contain enough for 2-3 portions. 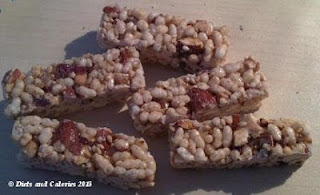 These delicious bites are made from cashew nuts, almonds and chewy fruits bound together with natural brown rice syrup. Varieties include Pomegranate, Raspberry, Sweet Almond and Sweet Cashew. The Stix come in a larger sized 113g pack and contain enough for 4 portions. If you’re not going to eat them all at once, they come with a resealable top so you can close them up to keep them fresh and crunchy. The Stix are toasted rice bars made from almonds, crispy rice, sesame seeds mixed with brown rice syrup and the relevant fruit or flavouring for each pack. Varieties include Cinnamon Cranberry, Mango Strawberry and Cranberry Blueberry. 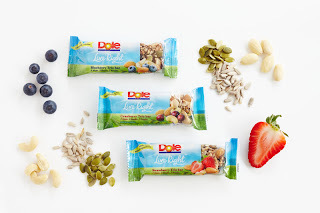 Single portion sized, individually wrapped, sweet crunchy bars crammed with nuts, seeds and fruits. Varieties include Cranberry, Blueberry, Strawberry. 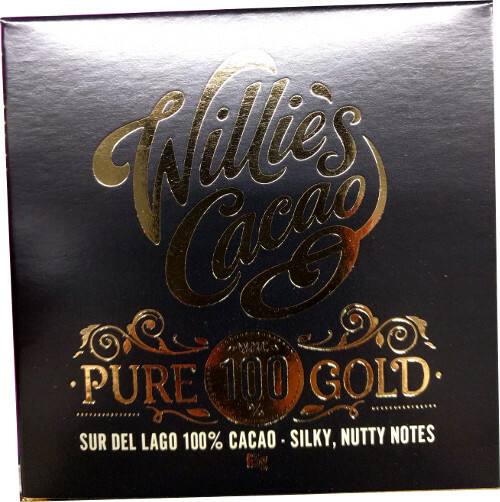 Each bar is made with cashew nuts, almonds, pumpkins and sunflower seeds as well as dates and raisins. All packs and the bars have a small clear window so you can see exactly what’s inside. They also provide all the nutritional information and recommended portion. So that's the range. And what a choice. Fortunately, all of us at the launch were given a sample selection of each type of snack to try out. Although I haven't tried all the flavours, I have worked my way through at least one of each type of snack. They're all subtly different in their own way, but equally delicious. I’ve had to use all my willpower not to carry on crunching my way through each pack, but it's been hard. Right now I’m surrounded by half eaten bags and it’s all I can do to stop myself dipping in for one more teeny nibble. The Bars are packed with nuts, seeds and fruit and covered with a sweet sticky glaze. They're crunchy, nutty and so tasty it's hard to believe they're healthy. The 28g Strawberry, Blueberry and Cranberry bars are sold three to a box with each bar worth 146 calories. The Stix, sold in the large packs, taste like truly luxurious rice cakes. These have a drier texture but still pack in plenty of nuts, seeds and fruit. The packs weight 113g and have 123 calories per portion (4 portions per bag). My favourites are the Crunch snacks, in particular the Sweet Almond Crunch. These are packed into 56g bags and hold two servings. Each chunky crunch is made from large pieces of nuts bound together with the sweet rice syrup. These are so irresistible I can't leave the open bag near my desk. 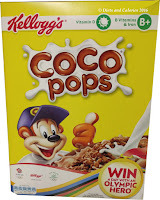 Packs have between 147 - 161 calories per portion and are sold individually. Sweet Almond crunch - deeeeelicious! The Mini Crunch snacks are a chewier as they seem to have a bit more fruit. Roasted almonds are still the main ingredient but the fruit seems to make up a similar amount. You get about 16 mini crunch bits in each 20g bag which are worth an average of 110 calories. These are sold in packs of five. At the time of writing, Dole Live Right snacks are being sold in Tesco stores. However, as they're new, it may be a while before they arrive in all stores. I haven't seen any in my local Tescos yet, but I'm keeping an eye out for them. I'll tweet when I spot them and please tweet if you find any in your local Tesco!